Blain: "European Elections In May Will See The Entire EU Leadership Replaced"
Enough said… Sentance should get the job. Meanwhile, in a galaxy far far away… Pimco just made a big bet on Italy. They’ve bought an entire $3 bln issue of Unicredito 5 year non-preferred senior bonds at a yield of 7.83%! That’s a spread 6 times wider on a swap adjusted basis to where its Euro denominated bonds traded back in January. It’s not the only big bet the investment firm has taken on Italy – it’s played big in BTPs and Italian NPLS (non-performing loans). Pimco’s bets on Italy might make sense. Italy shifts from sell to buy to sell in heartbeats at the moment, but the trend is positive for spreads to tighten. The populist coalition government has “stepped back” on threats to breach EU debt rules – saying just enough about reducing the budget deficit by a cosmetic amount to defuse an immediate crisis. Europe can relax that a concurrent Italy crisis alongside Brexit is avoided, but it won’t stop Italy: European elections in May will see the entire EU leadership replaced, and its likely a new parliament of rabid populists will be elected! Don’t be surprised if the Italians simply do what they want behind the sturm und drang of the electoral confusion and noise. To get their economy working they need to spend money the EU won’t let them! Don’t be surprised if it just happens and Brussels pretends not to notice. Don’t be surprised if the Germans get shirty! The second part of Pimco’s thinking may be the systemic importance of Unicredito in Italian banking and thus the EU. A major bank Italian bank failure, or bail in of senior debt, could trigger not only instability across the Union, but could also get difficult questions asked about French and German banks that could well swamp them. As the French and Germans are not (ever, never, ever) going to let their banks go to the wall, Pimco is gaming the Italians won’t let Unicredito go either. For the Italian banks, the outlook did look bleak. 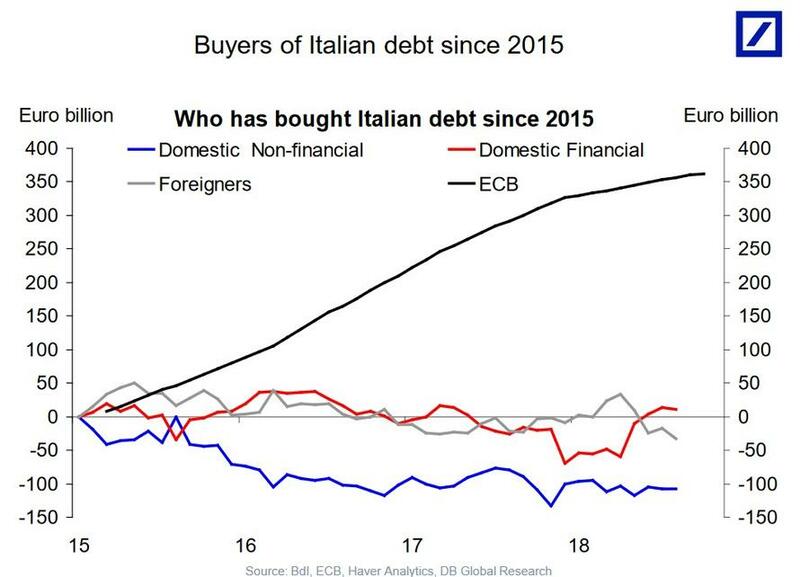 They are the major holders of Italian debt, and are only now cleaning up balance sheets and capitalisation levels trashed by aeons of unaddressed bad lending. As always, there are ways to “finesse” these problems. The EU is fast-tracking legislation to allow the banks to reduce capital allocated to Non-Performing loans (NPLs), while the regulators have invented new forms of cheap, non-combustible capital, that will make it look like banks are better capitalised. Unicredito had to issue this $3 bln quasi-capital bond to look like it was doing its bit in the great confidence trickery that is Italian banking. Although it’s called senior, non-preferred debt, it’s not really senior debt – its quasi senior debt masquerading as capital. Confused? You will be. Senior non-preferred debt is the new way to describe debt that can be bailed-in if it fails. As it can be bailed-in, its capital. It ranks where senior debt used to rank on the subordination ladder – below equity and sub debt – but now makes clear it ranks ahead of “operational liabilities”. I’d call it not-quite-subordinate-and-worse-than-senior debt, because that’s a more honest way to describe it. Meanwhile, Pimco is also betting on Italy. Since the European sovereign debt crisis erupted in the 2010s, analysts have repeatedly predicted the imminent demise of the country’s debt markets and that Italy will be swallowed up in a sea of defaulting debt. After all, Italy is making the schoolboy error of not issuing in its own currency – it issues in Euros, which is set according to the speed of the strongest economy. While Germany’s productivity and wages have been rising – Italy has become increasingly less competitive and less well paid. In short, Italy is issuing in Germany’s currency while it massively underperforms Germany, meaning it has to raise more and more debt just to stand still. Reform would require even more debt! The lesson Italy is currently having nailed into its collective political brain is quite simple. If you don’t control the printing presses – its not your currency. (Greece learnt same lesson, and then lesson 2: “you check out any time you like, but you can never leave”. The Italians can say what the like about raising debt to reflate their debt, but Brussels won’t let them and can threaten dire consequences. Therefore, the Italians have been very Italian about it and promised to keep their debt within proscribed levels.. which they won’t. And they will make sure their banks are kept going. All of which explains why Pimco is a willing participant in the Great Italian Bank Confidence Trick. The yield on the 5-yr debt is superb, they aren’t expecting any liquidity in the “bond”, they know Italy isn’t going to let Unicredito fail, and they expect Italy to i) continue to back the bank, and ii) if there is a problem with the EU, then standard EU operational procedure will be to fudge a solution where Italy isn’t closed down and can keep supporting Unicredito!